When Richard Kauffman sat down with utility executives in his new role as the chairman of finance and energy for New York State in the winter of 2013, the conversation was not just about the buzzword of resiliency in a post-Superstorm Sandy world, but about larger market trends around distributed generation that were challenging electric utility business models. Fast-forward more than two years, and New York is knee-deep in its Reforming the Energy Vision proceeding. The goal is to eliminate electricity peaks, enable markets at the distribution level for distributed, cleaner generation, and transform distribution utilities into platforms that support these new markets. The question is whether utilities and regulators can move as fast as the emerging clean-energy market around them. That execution, and the challenges ahead, will be on display this week at the REV4NY Exchange taking place in New York City. Much of what New York is doing is just stoking the fire that has already been lit as the costs of solar, storage and other distributed solutions continue to fall. “Communities and individuals care about energy,” said Kauffman, or at least many care about maintaining control over energy costs. New York state is pushing that adoption even further with programs that now are gathered under REV. Kauffman pointed to many wheels already in motion: the addition of Community Solar NY and K-Solar as part of the NY-Sun initiative; the first round of REV demos; and awards for more than 80 initial recipients in the first round of the microgrid NY Prize competition, more than triple the expected number of first-round awardees. There are also changes coming to New York’s large-scale renewables program, which will allow for more interested parties to take part in power-purchase agreements. 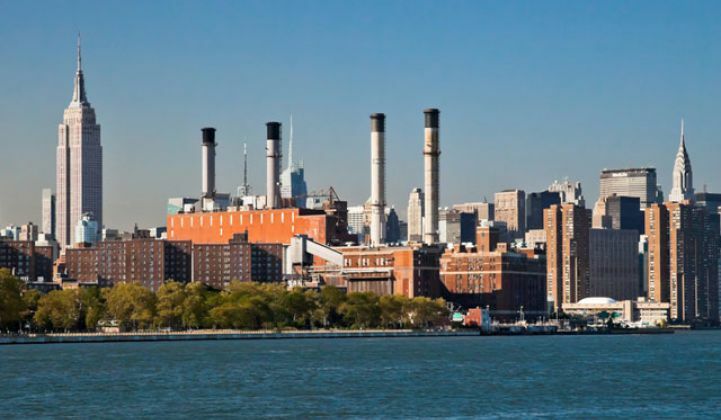 For those interested in watching REV, it will be worthwhile to keep an eye on coming rate cases from utilities, which are expected to incorporate elements of REV, similar to Con Edison’s use of demand-side resources to defer a $1 billion substation. Utilities will increasingly be asked to think outside the box and look to the market to solve their problems. For the most part, the process so far has been devoid of the acrimony found in some other states as they change what’s required of utilities. Most New York utilities see the writing on the wall and are embracing the opportunity to incorporate new revenue opportunities through REV demos, coming rate cases and the larger REV proceedings. The deregulated arms of utilities across the nation are eagerly watching to see if they can make some money in the Empire State. Kauffman mentions the word "markets" frequently, whether he’s talking about filling market gaps, leveraging the role of the state’s Green Bank, or the emerging distributed energy market that is helping to drive the REV proceeding. He is careful to note that the markets ultimately envisioned for New York’s energy sector will allow for a range of participant interactions, from those who want to participate directly to those who may buy a package of services from a third-party provider. The Green Bank may step in at some point to help animate markets that aren’t yet mature, and it may be a part of some REV demos in the future. Already, it is clear that the learning curve is steep, and not just for the utilities. “It’s a meaningful cultural change,” he said, speaking of utilities, as well as the roles of regulators and government. Even third parties will have shift to seeing utilities as both partners and potential customers. But not everything can move as quickly as some might like. The filing date for the utilities’ distribution system implementation plans (DSIP) has been pushed back to 2016 instead of the end of this year. Kauffman says giving utilities extra time only makes sense, as the REV process has put pressure on them to fundamentally rethink how they do business even today. “Every day moving forward, we want utilities to spend money on the system of tomorrow and not the system of yesterday,” said Kauffman. The REV proceeding may have left the station, but there are still plenty of places where it could derail. There are major issues of data-sharing and privacy and the requirements for the underlying platforms that still have to be hammered out. The price tag of innovation has not been set, either. Eventually, some significant portions of the REV vision, like the technology platforms to enable digital energy marketplaces, will have to be rate-based. By the time that happens, Kauffman expects that some of the REV demos will show consumers -- from homeowners to businesses -- what is possible with changes to the energy market. Ideally, the process needs to have so much market pull that it cannot be completely undone by future legislative efforts or the next governor. For those who cannot make REV4NY Exchange in person, check out the live stream, where you can hear many of the stakeholders involved in the current REV demos engage in conversations about the promises and challenges the proceeding is uncovering.